Welcome to La Bella Sirena! Close to the beach and in the rainforest! The house is a large, indigenous style home, hand crafted of the finest hardwoods. Our tropical garden setting is just 300 meters from the beach and a 5 minute walk to the beach/town of Manzanillo. Each suite is furnished with a king size bed where you can sleep in the comfort of luxury linens and stay cool ceiling fan style. The adjoining private baths are complete with hot water and high pressure showers. Outside your bedroom door awaits a private balcony where you can enjoy conversation or lie in the hammock for an afternoon siesta. Eat in or dine out? Choose to cook a delicious meal in your own fully equipped kitchen, grill fresh meats and seafood on our large, roof covered outdoor grill, or eat out at one of the nearby restaurants. Sitting areas in the front of the house are a great place to delight in nature and wildlife. We share our garden with sloths, monkeys, morpho butterflies, and toucans, to name a few. The house can be rented as a whole or you can rent just one floor depending on your party's size and needs. If you decide to rent just one floor, there is a private entrance for each. Parties of 2 can rent the whole house at a discounted rate to ensure privacy. The 2nd floor of the house is fully screened and the 1st floor bedrooms and bath are screened. The 1st floor kitchen and living areas are open air to catch a cool breeze and enhance wildlife viewing. We do have floor to ceiling mosquito netting curtains that can be pulled closed at dawn and dusk or as desired. While we feel a car isn't necessary and we provide 4 bikes to ride to the beach or local destinations, if you have young children or people in your party who are unable to walk aproximately a quarter mile, you may wish to have a car while staying at our home. Public transport is reliable and inexpensive as well and there are many transport methods to reach our home. local fruits, the variety of beaches, plus seeing monkeys and sloths. On the Caribbean coast we enjoy all that plus reggae music and diverse cultures living in harmony. We think you will be delighted if you choose this amazing destination for your Costa Rica vacation! World traveler who fell in love with Costa Rica while living with a family and studying Spanish many years ago. I enjoyed learning about this peaceful country with a high literacy rate, good health care, education, and no army or history of wars. Of course living in the northern US contributed to the decision to find a tropical escape from our cold snowy winters! My partner Victor and I looked for homes in Puerto Viejo and couldn't find anything to meet all our wishes so we decided to take a drive to a little beach town I had visited a few years before and we saw a land for sale sign on the way into Manzanillo and decided to stop. We fell in love with the beauty of the land and sighting a tree full of toucans seemed like a sign! It was then that we came up with the idea of designing and building our own home that had the best of both jungle and beach locations. There is one outdoor shower in the garden, besides the 3 in the house itself. All showers, sinks and baths have hot water from a central hot water heater. There are NO suicide showers in the house. The location of the house is wonderful. We were surrounded by Howler monkeys and even saw a sloth right on the property.The neighboring property has a path to the beach, and the gave us permission to use it. The beach is lovely and uncrowded. I'm not sure what the deal with the washing machine was. One of the reasons for choosing this house was the washing machine. Shortly before our trip I received an email saying that well water causes rust stains on clothing, but it also said people had been breaking the machine so she didn't want us using it. She said the housekeeper would do laundry for us. When we arrived we were told by Yari, the housekeeper, that she would do laundry only on the day she came to clean. I ended up washing laundry in the sink as we had been in another part of Costa Rica and had planned to do laundry right away. Also, nothing dries there, so we had to head to our third location with dirty damp clothing. So stating that the house has a washing machine is a bit deceptive. The informational email was sent a full 18 days before your stay. I asked our house manager several times about how your stay was going. She said your group was very happy and had no complaints. I never heard anything from her or you that you were unhappy about her schedule for doing the laundry. If we heard you were unsatisfied in any way, we would have asked her to make an exception and do laundry for you or show you how to use the washer. We are always happy to work with all guests regarding any issues with their stay and the email you received also asked you to let us know about any issues that came up. I also followed up with you to see if you received the email and had any questions or concerns before your trip. It is an unfortunate fact that we can’t do anything to assist you when you don’t tell us something isn’t satisfactory and waiting to complain about it in a review doesn’t help either of us We like to hear from guests immediately when we can make your stay better. Wishing you the best in your upcoming travels. Our family of five (3 kids- 8, 11, and 14) just returned from 8 amazing days at La Bella Sirena. Prior to our trip, Mary was very responsive and helped with all of our questions. Once on-site, Yari was very nice also. The house is well-located, close to the beach and store, but feels very private. We enjoyed lazy days with books in the hammock and cooking in the well-equipped kitchen. It was a great home base for our beach, jungle, surfing, and rafting adventures. We appreciated the bikes, beach towels, outdoor shower, and other little touches that made life easier. Waking to the howlers and other wildlife was a great experience. Thank you for sharing your beautiful home with us! Thank you Rachel and family for choosing us! We are so happy to heat that you enjoyed your stay at our home. Those howlers are really something, aren't they? Wising you all many more happy travels! The place is a bit hard to find, so make sure you come on daylight, we came at night and were very lucky to find Yari to help us. There are a bunch of monkeys live on the trees above the house, It was great watching them play from the small sitting area on the second floor. Thanks Oded! We are pleased to hear that you and your family enjoyed your holiday staycat Bella Sirena! Your familt was a delight to host. We really appreciate you taking the time to write an excellent review and share your experiences. Thanks for the shout out about our communication and extras we provide to guests upon request. We hope you will visit us again sometime. Happy travels! Wonderful tropical location with Howler Monkey sightings. Property is well maintained by the Lovely Yari - she kindly made us dinner each night with delicious dishes (this requires pre planning and an extra fee) but totally worth it. The house itself is nestled off of the Congo Bongo driveway - with plenty of space and walking trails. The showers had hot water - the hammocks were relaxing. Couldn’t ask for anything more. Bring bug spray, refillable water bottles, and sunscreen. Thank you so much for taking the time to write a lovely review of our home, Diana! We are happy to hear you enjoyed your stay! Isn’t our manager Yari a gem? We are grateful for all she does to make guest’s stays pleasant! Thanks for choosing Bella Sirena! Wild, raw jungle experience! If you love wildlife, stay here! This was my family’s first trip to Costa Rica, and we wanted a quiet getaway with lots of nature, not a lot of people, and beautiful swimmable beaches. We chose La Bella Sirena based on the great reviews and what seemed like a slightly off the beaten path location. We live in LA and enjoy our creature comforts, so I wasn’t sure what to expect at this house. After two weeks there, I can only say, if it looks like the kind of place you might enjoy, GO, and you will love it! 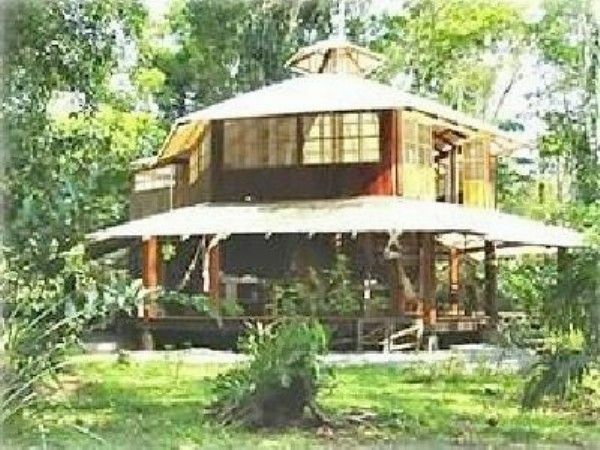 The house is located on a shared driveway with a small eco lodge, but when you are at the house all you feel is complete and total immersion in nature. The house itself is quirky and fun, and the stay felt like a grand adventure for my family. The open living/dining area downstairs is amazing, and there are fully screened and lockable bedrooms. The beds were comfy, and the availability of laundry as well as cleaning service every 4 days meant that even with all the outdoor living things still felt civilized. This area is amazing. You can walk or ride bikes (which are provided!) to many great beaches - Manzanillo is very close, Punta Uva a bit farther, but my 9 year old daughter loved the challenge of getting up and down the hills on the bikes. The people are incredible here and there are so many good restaurants your head will spin. It took us a couple days to learn how to spot monkeys and sloths, but once we did learn we saw them everywhere, including right at La Bella Sirena. We also saw agouti, peccaries, poison dart frogs, bats, and many beautiful insects there. Other places we were able to spot toucans, macaws, coati, and eagles. It’s crazy how much wildlife is in this area! Mary is a great property owner and she went above and beyond to help my family with our stay- including helping to arrange a driver from and back to SJO that made our trip so much more pleasant. That way we didn’t have to jump in a rental car and drive 5 hours across the country. The drivers were great, and just like everyone else we met in Costa Rica, professional and reliable. Last but not least, the caretaker at La Bella Sirena (who lives nearby but not on property) is Yari, a wonderful and kind woman who will help you get settled and help with anything you need during your stay. Just listen to Yari, and you won’t have any problems in this wonderful house! If you're looking for a jungle experience this is the place. The house is incredible. There are a lot of creepy crawlers but it's part of the experience. The room upstairs is incredible and you can sit on the deck and watch monkeys every morning. The howler monkeys are loud but we loved hearing them. We suggest taking the hike with Tino. Very informative and you get a real feel for the jungle. Gandoca-Manzanillo Wildlife Refuge located about 12 kilometers southeast of Puerto Viejo, and nearest to the small village of Manzanillo on Costa Rica’s Caribbean Coast is one of the most beautiful and scenic sites in the country. Fine sandy beaches, gentle waves, coral reefs near the surface of the sea all make this region a paradise for nature lovers and underwater enthusiasts.